Designing and building a bathroom, either in a renovation project or for a new house, begins with the definition of its appearance and then the plans. 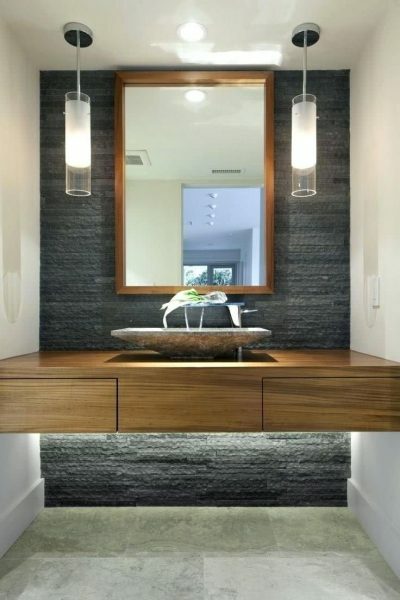 We will show you a few ideas of bathroom designs so you can achieve a functional and very beautiful space. 2 How to design or remodel the bathroom? 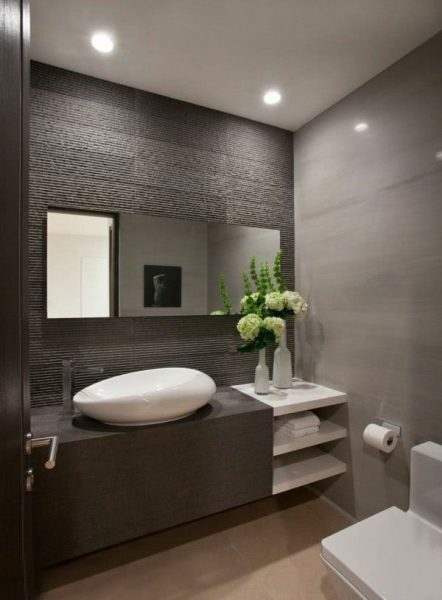 Choose a style for the bathroom with which you feel more comfortable and at ease is essential. Next we will show you some ideas. A contemporary bathroom combines functionality, design, practicality and technologically advanced products. Generally curves or soft corners, large tiles and hanging furniture are used. Above all, innovative materials are used, such as waxed concrete in the floors. 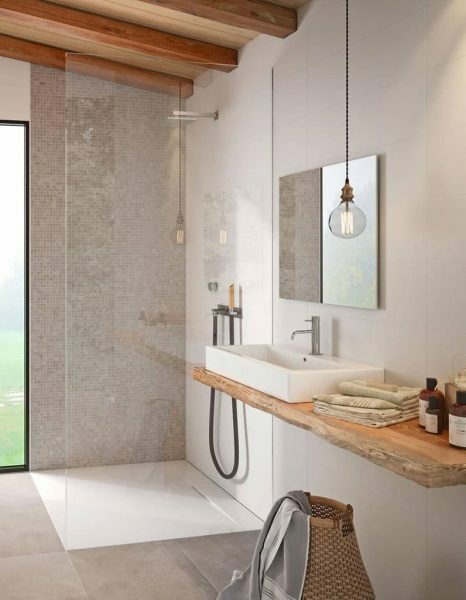 For a designer bathroom, do not hesitate to choose new shapes such as a totem-type washbasin, lighting with visible filaments and an original wall radiator. The bathroom should offer a functional and comfortable space. Everything must be optimized from floor to ceiling with storage that provides a lot of comfort and order. You can flashy colors and decorative objects from candles to flowers. If possible, a bathtub is chosen to enjoy a bubble bath, furniture with multiple arrangements for different appliances, and a large mirror or even several. This style takes us to a world as haunting as it is relaxing, where materials such as wood or stone are the protagonists. This type of design is one of those that are currently trending. They are bathrooms dedicated to relaxation, everything should bring well-being and zenitude. It uses bamboo wood, Buddha statues, teak furniture, etc. The Zen style is distinguished by its Japanese influences and its minimalist tendencies. The Japanese bathroom is an excellent choice if you are looking for a soft, relaxing and exotic environment. Attention, this style is based on the principle of great simplicity. To decorate, cherry blossoms, Japanese panels and paper or origami elements are used. The Italian-style bathroom seduces lovers of large showers and relaxation. Italian showers are characterized by their large size, without exposed shower tray, and usually have a rain shower sprayer. How to design or remodel the bathroom? One of the main points to take into account to achieve the perfect design of the bathroom, is the number of members in the family, either in the present or in the future and the space available. Keeping these two points in mind, you can surely make smart decisions. This is the simplest method to visualize the bathroom. 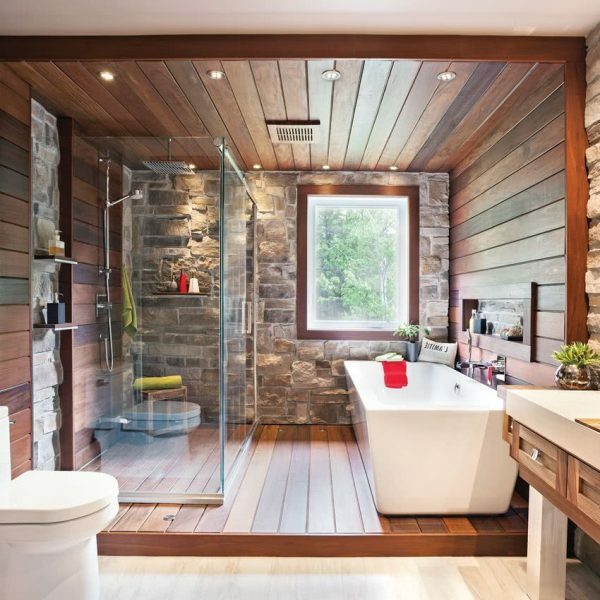 Is it a new bathroom or do you want to renovate an existing space? Drawing the design to scale, it will be much easier for you. You must measure the spaces, as well as the various sanitary accessories, such as the bathtub, the shower, the sink and the storage units. 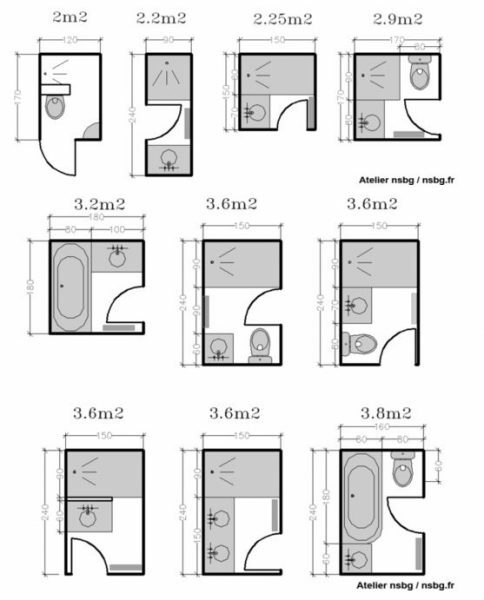 If you are going to build it from scratch, draw the necessary space so that the average dimensions of the sanitary facilities and the furniture that you want fit the best possible in it. These measures can be found on the web. On this basis, try to make the sketch as accurate as possible. Do not forget to take into account also the ceiling height of the bathroom. This can be important for planning the installation of lights or for placing tall cabinets. This will also help you have a clear vision of where sanitary and plumbing installations should be made. You must also determine where you want the heating, lighting points, switches, etc. All this information will be necessary at the time of consulting with a specialist in equipment for bathrooms and prices. Remember to consider windows and doors. Is the opening of the door inward? This is a lot of wasted space because nothing can be in the way. Is the window high enough to prevent neighbors from seeing you? It is usually drawn at 1/50 scale, that is, one centimeter in the plane corresponds to fifty centimeters in reality. If you perform a search on the Internet, you will find bathroom models that will allow you, for example, to represent the bathroom in 3D. If your budget allows, consider the possibility of working with an architect, who will undoubtedly help you get the perfect bathroom. The design will depend a lot on the space available. If the space is large, the possibilities will be greater. You can freely choose a bathtub or a shower. A double sink will be very practical if the family is large. As well as many closets to store, for example, towels and all toiletries and personal care. It can also be very practical to install a laundry area, or a relaxation area with a nice jacuzzi. In short, if you have a large space, you can get the taste and fulfill all your wishes and meet all your needs. 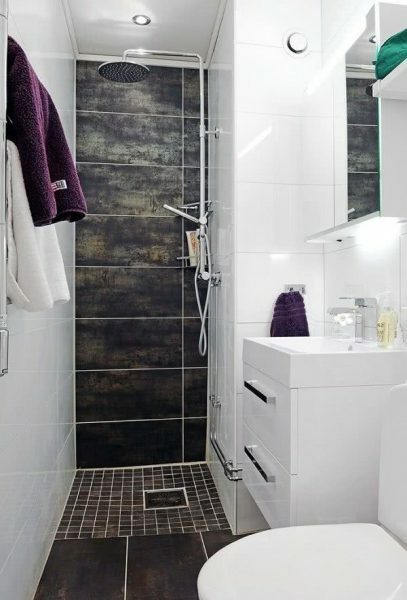 You will have to be much more creative if your bathroom is small, but this will not prevent it from being practical and comfortable. We will show you some tips that can help you. Shower or bathtub? A shower will save you a lot of space. However, for families with children, a bathtub is sometimes a more practical option. You can also add a wall, a shower screen or a shower curtain to use the bathtub as a shower. If there are no children in the family, perhaps a shower is the best option. Takes up less space. Separate toilet? It may be possible to place the toilet outside the bathroom. This will save you almost one square meter. And in addition, you will have much more privacy. Glass helps create the feeling of more space. A door with opaque glass can be a good idea, so you will preserve privacy, but you will give the room a feeling of greater amplitude. 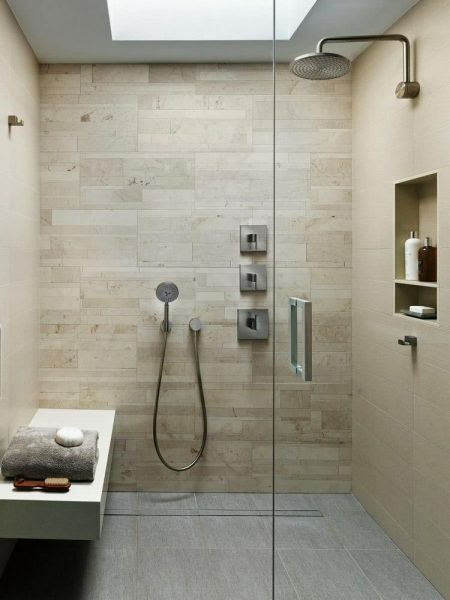 You can also replace the shower curtain with a sliding glass door. 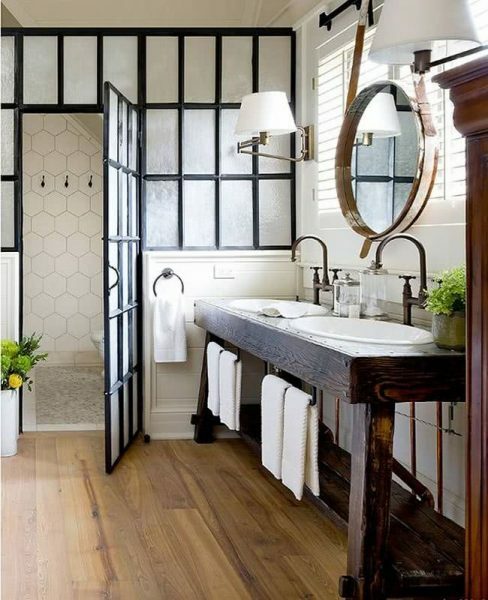 A large mirror will also help you increase space. 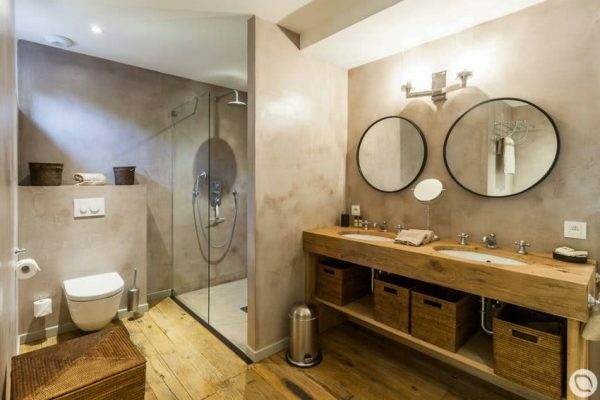 The bathroom furniture hanging on top of the wall also creates the illusion of more space. The effect is the same with a suspended toilet. The corners not used intelligently are lost spaces, without taking advantage. Just as the suspended toilet can be a good idea, placing it in a corner is also a good solution. Or if you prefer, you can add ambient lighting in one of the unused corners. Preserve the luminosity of space. Use light colors and avoid using too loaded decorations. 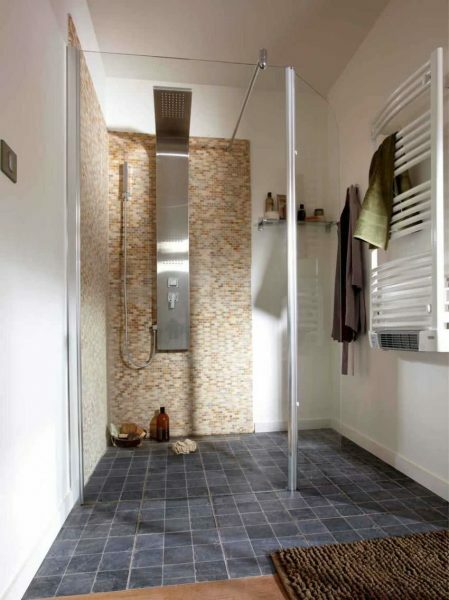 Therefore, large tiles are more appropriate for a small bathroom compared to the mosaics that weigh on the whole. The observation is the same for floor tiles. You can use multifunction accessories. For example, you can choose a sink with a built-in storage cabinet or a hanging cabinet with a mirror. A towel warmer with heating is also a good idea: it provides heat, dry towels and you want space. The furniture with horizontal handles also give you the possibility to dry towels can be used as towel rails. The whole room should have strategic plugs, but the most important ones are those that are around the mirror. There must be enough electrical outlets. These should be around the countertop of the sink, since they will be used to plug in the hair dryer, the iron or the shaver. But it can also be convenient to install additional lighting or to plug in a music player. However, keep the plugs at a safe distance (at least one meter) so that the water can not wet any electrical appliance. Do not underestimate the importance of enlightenment. There should be enough light in the entire room, but especially around the mirror, as this area is used for brushing teeth, shaving, applying makeup or removing contact lenses, for example. Do not forget to foresee a possible ambient lighting for relaxing moments.